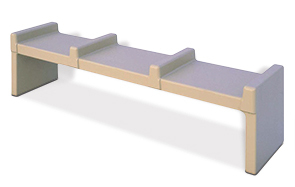 Deterrents help keep concrete benches in top shape by discouraging improper use. The simple minimalistic backless design features four molded in deterrents that provide adequate and safe place to sit, relax and enjoy the surroundings. The steel-reinforced concrete construction provides the strength and durability to last, even in heavy traffic areas for many years. This high quality bench is a sound, secure addition for almost any open outdoor space.